*By the way, if you just want to skip the middle man and not advertise my blog or tell people how great or funny I am, I am not above you just putting money into my PayPal account. Again, it is a really nice e-mail that they send. I am off topic again. I totally blame The Bloggess because I stayed up much too late reading her book, laughing obscenely loudly (perhaps it was guffawing) and forcing the Hubs to listen to me read portions of the pages while he was trying to focus on The Hunger Games because that is what I bought him with the Amazon Gift Card that I won for Mother's Day. He may never finish the Hunger Games if I keep reading to him. Tired and the reasons behind it were not what I was planning to write about so excuse that tangent. Today, I am here to discuss with you the chickens. The chickens that moved in last summer (along with the bear). 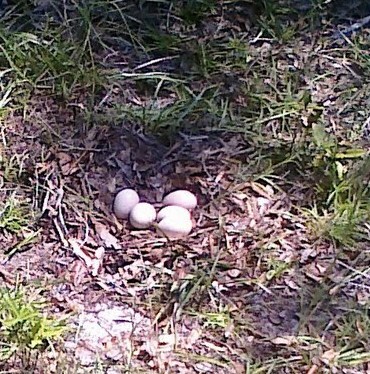 My neighbors chickens that he will not feed or care for. They have now lived on our property for a year. In that time, I have stumbled upon many a nest (as evidenced below), but the hen never wanted to stay on the nests and the next thing you know we would have possums, raccoons, and snakes coming in to scoop in the abandoned nests. This year, she has decided to actually stay on her nest and I am very excited that we will soon be the proud owners of many chickens. We don't actually own the chickens that live with us because they are not really ours. Their offspring that are being born in our yard, however, are a very different story. At any rate, I felt bad that she would soon be a mother but didn't really have a name so I named her Fern. The rooster's name is Henry. I have been taking Fern seeds so that she would not starve and she has become very comfortable with me coming around. I have also set up a fresh water system near her nest so that she can also get cool fresh water when she needs it. Once a day, she gets out of the nest to stretch her legs a bit. She stays out for about an hour and apparently is so grateful for the food and water that she stoops right in front of our porch steps and lays me an egg. I am not sure if it is normal for her to continue to lay eggs like this but now that we know that this is what she is doing, I think we shall start collecting (and washing her eggs) because, seriously, the price of eggs is pretty ridiculous these days (and the lady at work that brings them from her farm and sells a monthly subscription) is making quite the chunk of change for her deliveries. Anyone got any advice on being the momma to bunch of little baby chicks? I am pretty sure they get abandoned after hatching and I don't want Henry to go all crazy and start eating his own offspring.